Sergio Marchionne: “The primary objective of the IPO is to provide financial, long-term stability to Chrysler." PARIS (Bloomberg) -- Chrysler Group LLC’s initial public offering may be “relatively small” and in “chunks” so the U.S. automaker run by Fiat S.p.A. can establish a base market for its stock, the company’s top executive said. The automaker’s financial performance next year will support an IPO in the second half, Chrysler CEO Sergio Marchionne told reporters today at the Paris auto show. He is also CEO of Fiat. Marchionne is almost one year into a five-year plan to rebuild Chrysler after its bankruptcy last year. Fiat controls Chrysler with a 20 percent stake that can be increased by meeting certain milestones. The majority of the stock is held by a trust established to cover medical costs for union retirees. “One of the options is to do an initial public offering that would involve a relatively small issue” then come back six to nine months later to do a wider distribution so the United Auto Workers’ trust can sell its shares, Marchionne said. The UAW retiree trust holds 67.69 percent and the U.S. and Canadian governments hold a combined 12.31 percent. General Motors Co. is seeking to raise $8 billion to $10 billion in an initial public offering in November, two people familiar with the situation said this month. That’s a smaller target than the Detroit-based automaker earlier anticipated, because the U.S. Treasury, which owns 61 percent of GM, prefers a higher share price to a large offering, the people said. Marchionne said Chrysler would seek to raise “by far” less than $8 billion. He reiterated that Chrysler is ahead of plan with its financial performance for the year. Chrysler’s U.S. vehicle sales rose 10 percent for the year through August compared to last year, according to the Automotive News data center. Total U.S. vehicle sales increased 8 percent during the period. Chrysler may have led U.S. automakers with a 48 percent sales increase during September, according to the average of six analysts’ estimates surveyed by Bloomberg. Chrysler reported a first-half net loss of $369 million while posting operating profit of $326 million. The results exceeded the automaker’s guidance that operating results would be break-even to $200 million. 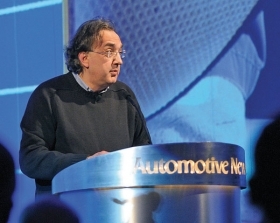 Marchionne has signaled that profit and cash guidance will be upgraded after the third quarter. In August, he said the automaker would have a difficult time turning a net profit for the year.